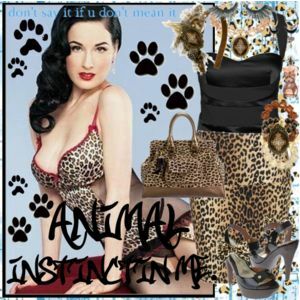 Animal patterns have been a part of fashion for years….The use of real skins in the US used to be a most fashionable form of expression. and design………coats, collars, hats, ……………….. Animal patterns always add that special. classy touch and work in complimentary ways for any woman! Cant get it right for me. I see great rags in the mags and out on the streets. When I shop I don’t have the eye. I am frusterated! Help Please! DITA is the beauty of dark glamour naughty yet sweetly mysterious. I am inspired to find that in me. My animal that is. Having one “over the top” glamorous piece to work an outfit from expires me! Maybe it is an oversized ring or bracelet, a funky top, a new lip gloss, or a new pair of boots! Whatever it is, take your “focus” piece and build a fabulous outfit that is tasteful yet glam! Having a little something to look at through the day puts a smile on your face and a skip in your step!